OK, so I've always kind of had a thing for Abraham Lincoln. My ardor has diminished slightly over the years -- I no longer believe I am he reincarnated (we do have the same initials, after all) -- but I have never forgotten that I grew up in the Land of Lincoln, where his birthday is a school holiday. 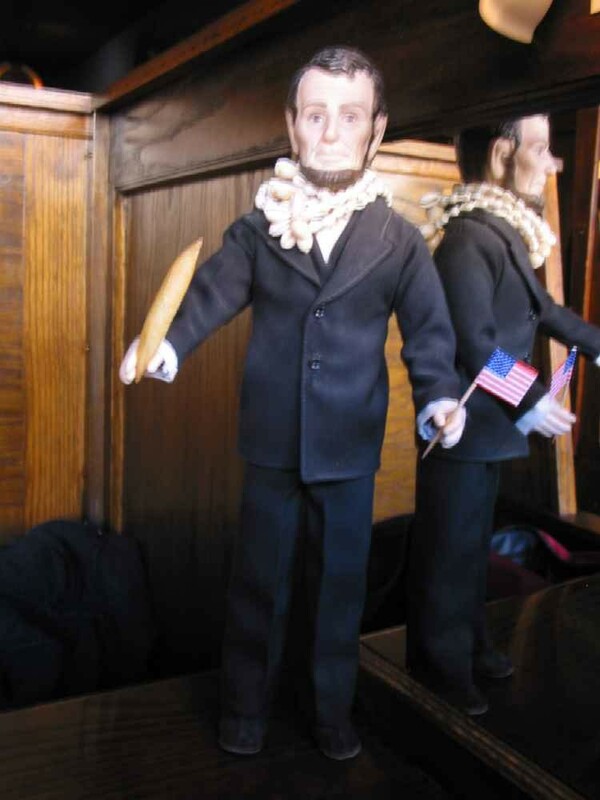 I, um, also keep a Lincoln doll on my desk. He was a gift from my grandmother, who used to love to shower me with useless gifts. At one time, he had a stovepipe hat, but it blew away one blustery day in eighth grade when I took him to school to be a visual aid in a communication arts presentation. As compensation, somewhere along the line he acquired a pukka shell necklace. These days, we pretend it's a gift from President Obama. 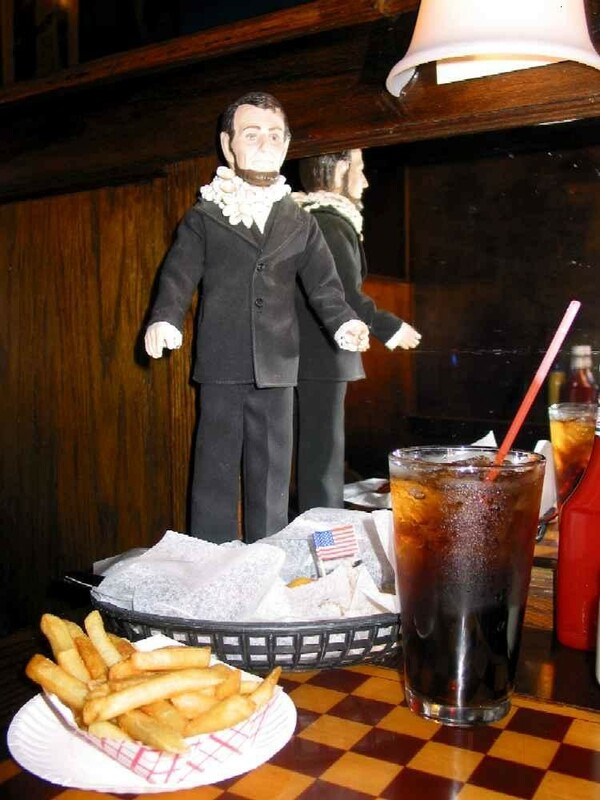 So anyway, when I heard that Blueberry Hill (6504 Delmar Boulevard; Web site) was serving something called The Gettysburger this weekend in honor of old Abe's birthday, I decided it was high time for us to have a lunch date, just the two of us, outside the office. After all, a guy doesn't turn 200 every day. "Four score and seven -- no, wait, uh, eleven score and, um, twelve years ago..."
To all appearances, the Gettysburger looks like an ordinary Blueberry Hill burger. You can get it in meat or veggie with a variety of cheeses and toppings. But here is what makes the Gettysburger so special: It comes with a tiny American flag and a copy of the Gettysburg Address. Since it's the brainchild of Joe Edwards, a portion of the proceeds from the Gettysburger (on the menu through Sunday) will go towards financing the revived Loop Trolley. A true son of Springfield might have preferred a horseshoe sandwich, a beef patty piled with fries and cheese sauce, but alas, this is merely St. Louis, so Lincoln had to content himself with American cheese and fries on the side. Our server, Christy, left us with our copy of the Gettysburg Address after we placed our order. Abe skimmed it over to see if it had changed any in the seven score and six years since he'd written it. It hadn't, though he allowed that it looked much nicer printed on heavy paper stock than it did in its original form, scrawled on the back of an envelope. For reading material, I had brought along Lincoln: The Biography of a Writer by Fred Kaplan, but Lincoln rejected it in favor of the current issue of Esquire. He enjoyed the breakfast recipes, but seemed disappointed that the frock coat and stovepipe hat would not be coming back into fashion this summer. But his stubble is quite au courant. The fry is mightier than the sword! The Gettysburger was superb, slightly charred, but also pink and juicy. Maybe it was patriotism, but it tasted better than the regular Blueberry Hill burger. Or it could have been that I was just extra hungry. The fries, I must also add, were unusually crisp and spectacular today, with just enough grease to make them go down easy. I paid the check. The Gettysburger, alas, does not fall into the category of $6 Gourmet, but on Lincoln's Birthday, you ought to live a little (even if Lincoln himself cannot). Outside, walking past the model of the Loop with trolley, I noticed that the omnipresent music from the loudspeaker had changed from Judy Garland singing "The Trolley Song" to the O'Jays' "Love Train," probably in honor of Valentine's Day. I am not sure if we have Abraham Lincoln to thank for the O'Jays -- think butterfly effect -- but it felt good to be able to celebrate his birthday with some nice red meat and fries. It was an occasion for dancing. So I did my uncelebrated white-girl wiggle back to the office. I am sure that if Abe were able, he would've been dancing, too. "Hey! That guy looks familiar!" 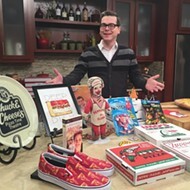 Update, Feb. 13: Joe Edwards called me last night to tell me personally how much he appreciated my Lincoln enthusiasm and to offer me a gift certificate for another Gettysburger and an invitation to visit the talking Lincoln, which says twenty things. My (usually silent) Lincoln and I were duly impressed.